Clean and wash all the crabs. Break the thin ends of the legs and keep the thick ends with the body part. Break the crabs into two pieces in the middle. In a dish, mix the chilli powder, turmeric powder and salt into a paste adding little water. Add the crab pieces into the chilli paste and mix well so each piece of crab has been smeared with the paste well. 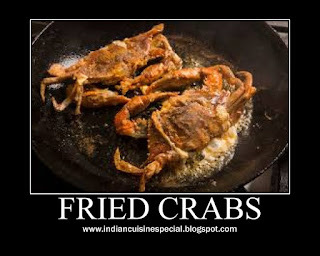 Deep fry these crab pieces in oil and drain and remove. Slice the onion and cut the curry leaves into two. In a clean hot pan fry the onions and curry leaves until onions are golden. Add the fried onion and curry leaves to the fried crab pieces and toss well.